home > topics > microsoft access / vba > questions > how to add a value from a record in table a to a record in table b if the value is? How to add a value from a record in Table A to a record in table B if the value is? I want to add a value from a record in Table A to a record in table B if the value is same as 2 other fields in the Table A. How could i get this done in access?? 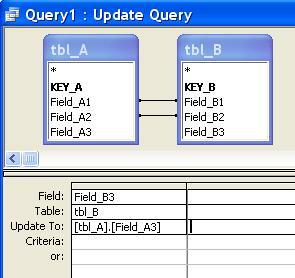 Then set the query type to Update Query, add the Field you wish to update to the bottom list of fields, and then in the Update field simply type TableA.Field1. Update query on definite record(row) of table.